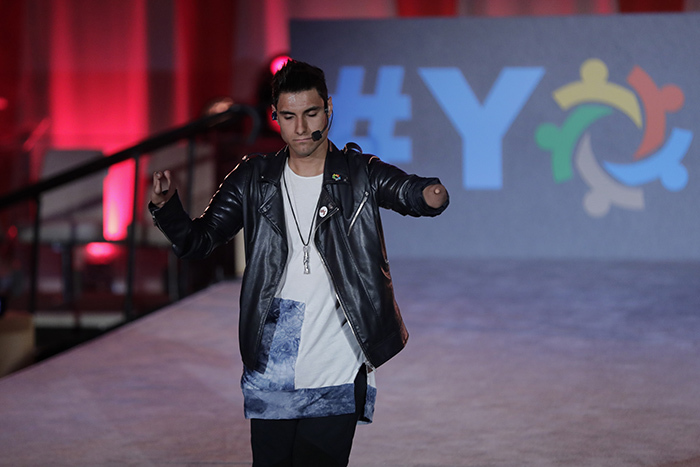 United Nations, New York, USA, May 30, 2018 – Singer and songwriter Emmanuel Kelly tells his story and sings his song at the President of the General Assembly’s Youth Dialogue. (#Youth72) today at the UN Headquarters in New York City. Emmanuel Kelly, the boy abandoned in a shoe box in Baghdad, Iraq, disabled or differently abled by the impact of chemical weapons in war, spoke and sang on May 30 in the UN’s Economic and Social Council chamber. From his new single, he sang “I will never be alone.” Earlier he told the audience about growing up afraid for his life in Iraq but with determination, will power and hope. “Show yourself,” he said referring to his dream, now coming true, of being the first “differently abled” pop superstar. He spoke along with UN General Assembly President Miroslav Lajcak as part of the latter’s Youth Dialogue, along with UN Youth Envoy Jayathma Wickramanayake and Tongan Olympian Pita Taufatofua. Emmanuel Kelly’s first move was from the shoe box he was abandoned in to an orphanage of Albania-born Mother Theresa in Baghdad, after a nun found him and took him in. In 2000, Moria Kelly bought Emmanuel and theboy who had become in essence his brother, Ahmed, back to Australia for medical care. They were not separated. After eight surgeries, Emmanuel emerged with that dream of being the first “differently abled” pop superstar. And through an appearance on the X Factor in Australia, it began to happen. Emmanuel Kelly’s story also exemplifies the hope that refugees can bring to the countries that take them in, in this case Australia and now the United States, where he has performed in Las Vegas and elsewhere. Also speaking in the UN’s Economic and Social Council chamber on the morning of May 30, beyond Pita Taufatofua who represented Tonga as a snowboarder and flag-bearer at last winter’s Special Olympics, were Shamoy Hajare, Founder of Jamaica School for Social Entrepreneurship, Safaath Ahmed Zahir, Co-founder Women and Democracy and Mohamed Sidibay, Peace activist with the Global Partnership for Education. Lajcak’s note for the event stated that the UN “General Assembly will convene a Youth Dialogue on 30 May 2018, with the aim to build a conversation between young people and all stakeholders. This is not a regular UN event. The most important part of dialogue is listening. As such, the event was shaped by and will be run by young people and we will ensure that youth get the mic. The meeting will be an occasion for participants from government, civil society and youth representatives, to discuss education, employment and the prevention of radicalization leading to violent extremism.” Who was better to speak than, from Iraq, Emmanuel Kelly? No one. He will never be alone.